If there's any indication as to how much cars have grown over the decades, it's by looking at small cars. Small, commuter hatchbacks of the 1970s and 1980s were always considered to be relatively tiny things among the large American cruisers that were still commonplace at this time. Compare any hatchback from 30 years ago to a "small" car now, though, and the first question will be, "When did they get so huge?" Which is why this week I've assembled a couple of cars that have always been considered small. People these days keep saying it's time for them to get a small car and that's tricky when so few of them could be considered anything but massive compared to what I've brought here. The first-generation Honda Civic was such a landmark car for the company that the second generation has somewhat been overlooked in the pages of history. It was an incredibly popular car and they are still out there. 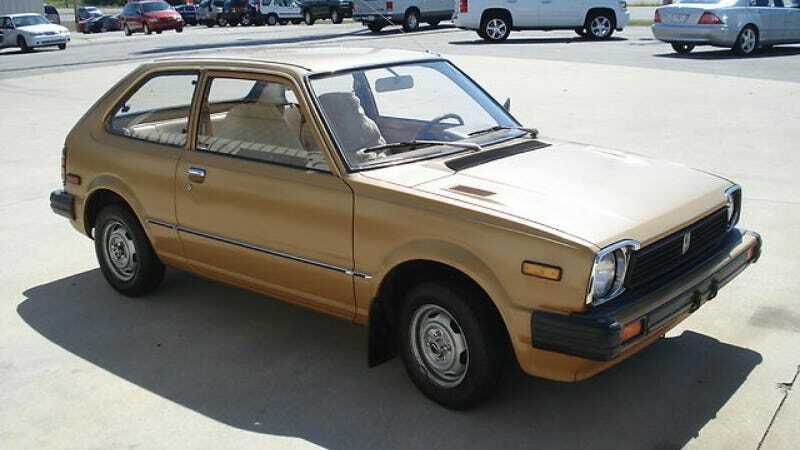 Like this one, a 1981 Honda Civic 1300 hatchback (152 inches long) painted in a gleaming gold-like color. At 130,000 miles or so, this is a very clean example, even if it was probably used very lightly unlike most Civics. This is the more sparsely equipped base model, but even it still has luxuries such as an AM/FM radio with cassette and, wait for it, air conditioning! Why do we even need more amenities in cars? You got 68 horses with the CVCC engine here, which is good for some acceleration through the four-speed manual. The person who owned this car also appears to have some fixation on covering stuff with fake sheepskin, and I question that decision. The price of $2,800 sounds like a lot until you think about the fact few of these cars are this well-preserved and the scene for restoring a 1981 Civic isn't as robust as it might be for other cars of similar vintage. And that's because if you're going to save a small hatchback of this era, you might as well think outside of the box. Oh yes, the Renault Le Car. Renault may have been known for its confusing series of numerical names through the years, but the decision to take the Renault 5 and make it the Le Car for the North American market seems like a half-assed move at best. But they sold literally some Le Cars through AMC/Renault dealers between 1976 and 1983 and, even more amazingly, some still exist – like this 1981 Le Car five-door (138.6 inches long). Adding two extra doors didn't really help the Le Car's profile, but it's an altogether more handsome car than the Civic. The French put more effort into making a tidy overall package than the Civic's designers did, especially inside, where it's way more modern than a car designed in the '70s should be. Let's face facts, though. This particular Le Car reads just 74,000 miles on its odometer. It's a 32-year-old French car that hasn't been registered in four years and has some rust issues. While there isn't much on it to go wrong, the stuff that is still there to go wrong will no doubt be frustrating to fix. And because it's much more rare than the Civic and its fan base much less rational, it's probably going to be more expensive to buy. With all of that in mind, I would have the Le Car. I'd drive it until no level of Renault knowhow and wizardry could keep it going, at which point it becomes an interesting lawn ornament I can park a Mk7 Golf GTI (167.5 inches long) next to.